Wedding season is upon us! Every year there are different trends in fashion, home decor, and wedding design. From color palettes to balloon installations, there are so many trends to look forward to. I am here to deliver to you some of the top wedding design trends to look out for according to some of the amazing Planners in the industry! This trend seems to be the most peculiar, considering that these darker, moodier palettes contrast with the blush decor and soft textures that has dominated the wedding scene in recent years. Here are two weddings that we have done that showcase this new trend very well; on the left is a color palette that mixes black linens and purple hued lighting with white florals and heavy greenery. While on the right, we had a mixture of a deep navy blue with our gold shadow boxes and magenta florals. 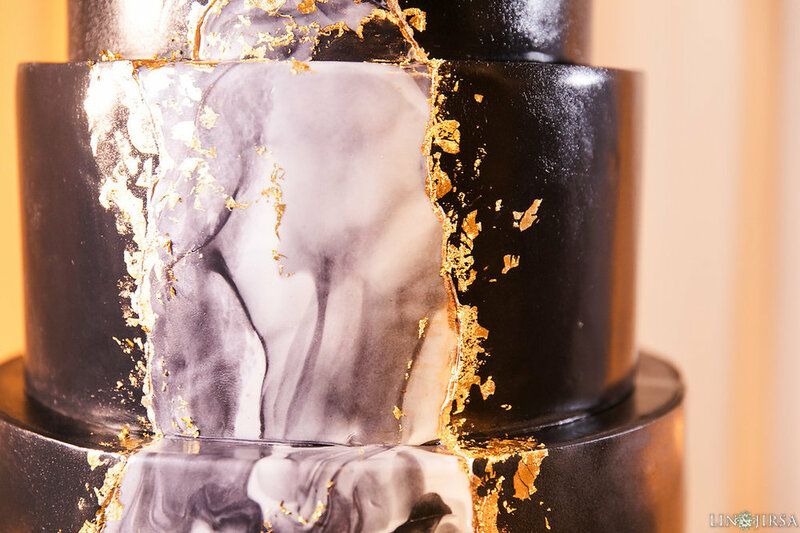 Dessert displays were still widely popular in 2018, but more couples are trending back towards splurging for one big focal statement cake, as is the case for a bride we had just this January. Prince Harry & Meghan Markle’s royal wedding continues to inspire nuptials of the future; large flower installations over the door are going to be very popular in 2019. We have done quite a few large flower installations over the years, though one of our most notable installs happened this past November at Pelican Hill. A lot more couples are embracing a round or long winding aisle, switching up the set-up is an easy way to further personalize the experience. We have had a bride do an entirely encompassing circle, as well as a bride who chose a more relaxed version, but both brides made it their own. According to our friend Mindy Weiss, balloon walls are the new flower walls. "Balloons are no longer just for kid's parties and New Year’s Eve—they make for wonderful, celebratory décor for any event, including weddings," and they’re not the typical balloon arch from your old high school dance either. We have had many balloon installations at our events, check out this one from an event we did last May. Pampas grass and wheat are becoming a popular alternative to flowers, they add an element of chic while also adding another layer to the design. They are great to use in floral arrangements and ceiling installations as they add a lot of body, but not a whole lot of weight. 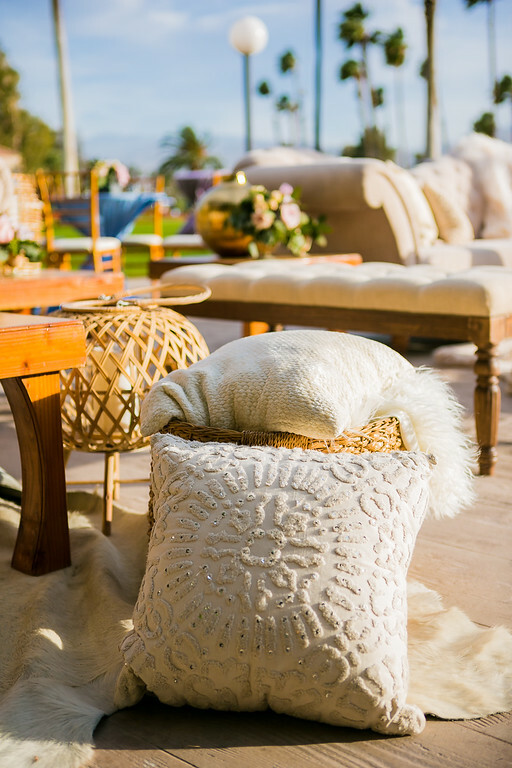 Making an outside space feel as homey as possible is definitely up and coming for weddings in 2019! For so long we have been bringing the outdoors inside, which isn’t going anywhere anytime soon, but this new fresh take on it is definitely making its name. We had a bride do this for her cocktail hour, which was a perfect opportunity because her ceremony and reception were both indoors. This blog post was inspired by 15 New Wedding Trends to Watch for in 2019. All events shown were by Shawna Yamamoto Event Design (with the exception of the Royal Wedding). Photo credit in order of appearance: Robert Mora Photography; Greycard Photography; Lin and Jirsa; Duke Images; Bret Thickman Photo; Andrena Photography; Alicia Mink Photo; Brandon Kidd Photo; Lin and Jirsa; Sarah Mack Photo. Thank you to everyone who helped in bringing each of these events to life.